Suction valve and the exhaust valve is used to complete the suction & discharge stroke in Internal Combustion Engine. A suction valve allows the fresh charge of air-fuel mixture inside the cylinder. This mixture is compressed and burnt by other parts. Due to the combustion process, large heat is developed and it makes exhaust valve very hot. This is due to burnt gases escape from this valve to atmosphere. 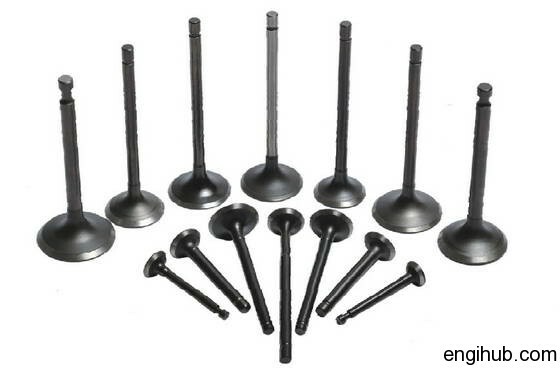 As exhaust valve of an internal combustion engine is subjected to very high temperatures. Hence it is necessary to cool it down in engineering way for the better performance of the engine. 01) By providing a suitable number of jets on the channel through which cold water directs from the radiator are pumped. The water flowing from these jets or nozzles in contact with the areas adjacent to the exhaust valve and exhaust port, which are thus cooled. 02) An improved cooling can also be achieved if cooling jackets are provided more elaborately near exhaust valve and exhaust port. 03) By filling a part of the stem of the exhaust valve by sodium, you can achieve better cooling. The solid melts at a high temperature (Near about 750-degree centigrade). It is thrown up and down due to the motion of the exhaust valve. The heat from the hot region is thus conveyed to the comparatively cold region. Hence it is more important to keep all the parts in workable limits for the better efficiency of an engine.